Joseph Benavidez, 34, and Mia Avalos, 23, were arrested and charged with Trafficking a Controlled Substance. For the past month the Albuquerque Police Department Narcotics Unit has been conducting an investigation into drug sales in the Southeast Area Command. 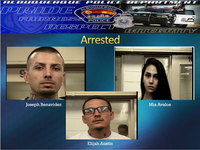 During their investigation they were able to determine that Mia Avalos and Joseph Benavidez were selling narcotics at a local smoke shop in the area of San Pedro Ave and Kathryn Ave. Detectives learned the two were being supplied by Elijah Austin who also resides in the area. A search warrant was obtained and detectives located Heroin, Methamphetamines and a firearm at Austin's home. Austin was not located on this day however his case has been forwarded to the District Attorneys office for a Grand Jury Indictment. Joseph Benavidez was arrested and charged with Trafficking a Controlled Substance and Conspiracy. Mia Avalos was arrested and charged with Trafficking a Controlled Substance and was booked on outstanding warrants. Both have been released without bond since this arrest. The APD Narcotics Unit has been working extremely hard to get offenders like these off the streets of Albuquerque and we have been successful at doing this several times. Officers with the Albuquerque Police Department will continue to do this in an effort to keep the community safe.